Listen to Rev. Joe Marchio introduce the new "Big Bell". Ringers rehearse each Thursday morning from 9:00 to 10:30 a.m. Special music by the handbell choir celebrates national and religious holidays. The choir provides music for worship approximately once a month. 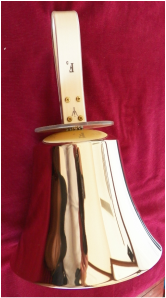 Membership in the handbell choir is open to experienced and novice ringers and instruction is offered to beginners.